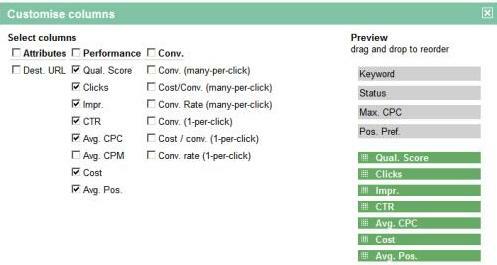 10/10 Keyword Quality Scores on your Google AdWords? 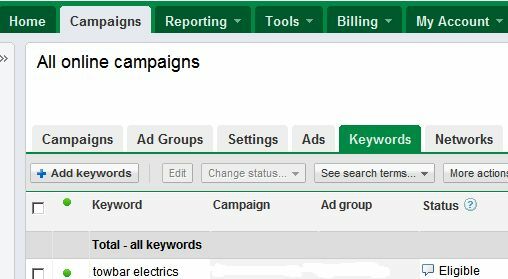 Adwords Marketing with the UK English Voice. Browsing, you agree to Cookies but if you disable Cookies then this site will still function normally. How to find, understand & improve your Keyword Quality Scores. There has been a lot of news stories and debate about Google's recent changes to Keyword Quality Scores by Google AdWords. PPC Promotion Ltd have also noted an increasing number of search terms that were asking questions about their keyword's quality scores and how to improve them. How to discover the quality scores for your keywords. How are these quality scores calculated? Improving your Keyword Quality Scores. How to Find your Keyword Quality Scores. 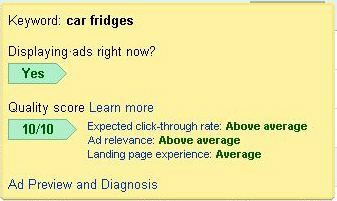 new Adwords Interface is to hover your mouse over the 'Speech Bubble Icon' next to the Keyword in the Status column. Hovering over the 'Speech Bubble', left, generated the live status and QualityScore panel in yellow, above, right. NOTE The latest reporting improvement with more detail for your expected click-through rate, ad relevance and landing page evaluations. Click on the Campaigns Tab. Scroll down to the next set of green tabs. To reproduce the picture, above, with the 'speech bubble' next to the keyword you will need to use the side panel to drill down to the Ad Group. 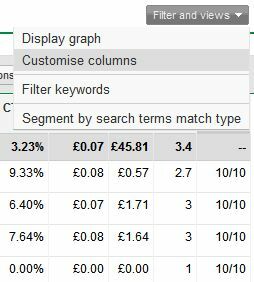 When you have added many Keywords you can change your Keyword Table view to add a column with your Quality Scores. green tabs you will find a Grey 'Filter and views' Button, see picture, right. Click on this button then select 'Customise columns' from the drop-down list. Check the Qual.Score box, see below. You can also modify the order of the columns. What contributes to your Google AdWords Quality Scores? The best approach is to start with the Google Help pages. What is 'Quality Score' and how is it calculated? This page contains two lists of factors for the Search Market and for the Content Market. The search network list is below is extracted from Google's help page, see link above. that must be brought out. Your Landing Page load times. I will not wait as long for a paid link. How can you improve your Keyword Quality Scores? There are many factors that are used to calculate your quality scores. Sometimes original content rich sites are out-preformed by simple sites with a half a dozen pro-forma pages. How can that be? This section introduces two simple techniques from our toolbox. We use the following approach to build relevance chains. Look at your keyword term. What would someone typing that term be looking for? Is your Ad relevant to the searcher's goal? Are the main words from the term used in your Ad? If not, should these be split into a different Ad Group? Does the Ad land on a page about your Keyword term? this addressed in the landing page. all claims within a click. To read about some of the trust problems that have led to this lesson continue with the Building Trust discussion on the right. + Add a Privacy Page. his top 8 sites and the next half dozen. There was nothing that he was doing that was different or wrong. The difference was found on his target sites. the non-profit sites did not! Yes this might seem to be a bit of a jump beyond improving Quality Scores. Yet how do Google judge the best landing pages and websites. By observing visitor behaviour on many websites. Look for the objections that people might have. Then try to answer them. your site for the first time. Get them to go all the way through the process. possible and have learned every time. The major issue for online businesses these days is trust. Rob has blogged about the BBC report that .co.uk domains were used by Chinese based scam merchants to sell fake goods. He ranted about "Selling .UK by the pound" but also touched on Quality Scores too. Google's Quality Scores are also looking for the signals that help visitors to trust a website. Will I unleash a torrent of heavy sales calls? 10/10 Quality Scores. These do not have to be boring as this older post explains. © 2019 PPC Promotion Ltd | All rights reserved. | Registered no. 6829291.